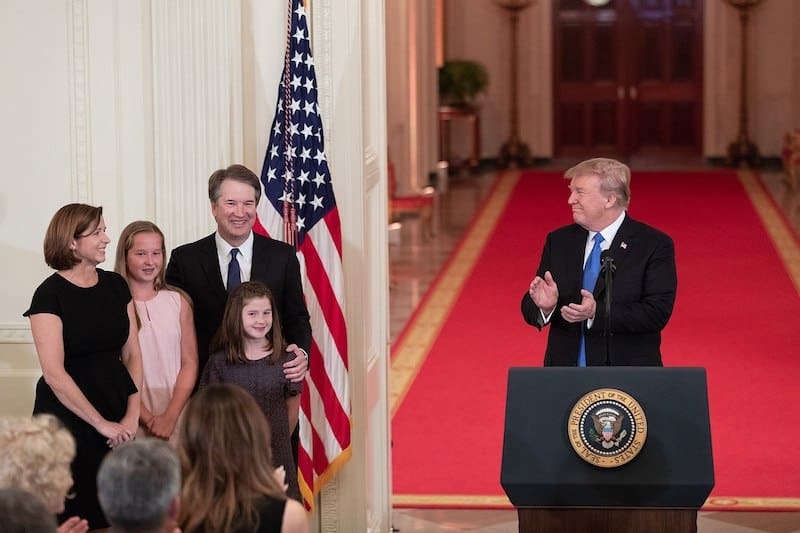 President Donald Trump’s advisers are increasingly viewing his ongoing support for embattled Supreme Court nominee Brett Kavanaugh as a threat to his presidency, Vanity Fair reported on Monday. While in New York attending a United Nations summit, Trump reaffirmed his faith in Kavanaugh, who is facing allegations of sexual misconduct by at least three different women. Trump has said publicly he is with Kavanaugh “all the way.” Privately, however, the president “is becoming increasingly frustrated by being mired in a deteriorating political situation beyond his control,” Gabriel Sherman writes. If Democrats manage to retake both chambers of Congress, and they have the votes to impeach and convict Trump, his presidency will effectively be over. Sherman says key allies of the president are pushing him to withdraw Kavanaugh’s nomination and replace him with Judge Amy Coney Barrett of the United States Court of Appeals for the Seventh Circuit. Trump is also said to be looking for a way to distract the public from the Kavanaugh story, Sherman says, providing a possible basis of rumors that Deputy Attorney General Rod Rosenstein had resigned, which shook Washington on Monday morning. “The strategy was to try and do something really big,” the source said. Early Monday afternoon, White House Press Secretary Sarah Huckabee Sanders announced that any decision on Rosenstein’s fate will come on Thursday. Trump and Rosenstein are scheduled to meet at the White House following Trump’s return from New York. Rosenstein oversees Special Counsel Robert Mueller’s investigation into the Russian attack on the 2016 election and whether Trump obstructed justice when he fired FBI Director James Comey in May 2017.